I’m calling it done. 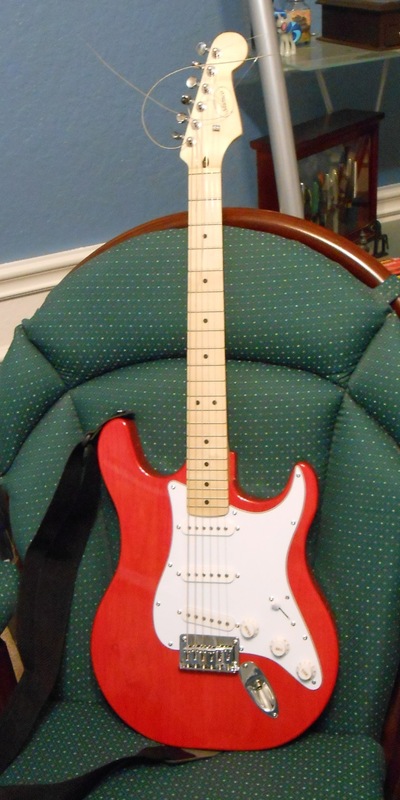 Still needs setup and string trimming, which is to say, it’s as ready as a store-bought version. I lowered the plastic nut, possibly too much, but it’s pretty easy to make a new one from bone which I probably have somewhere around here. 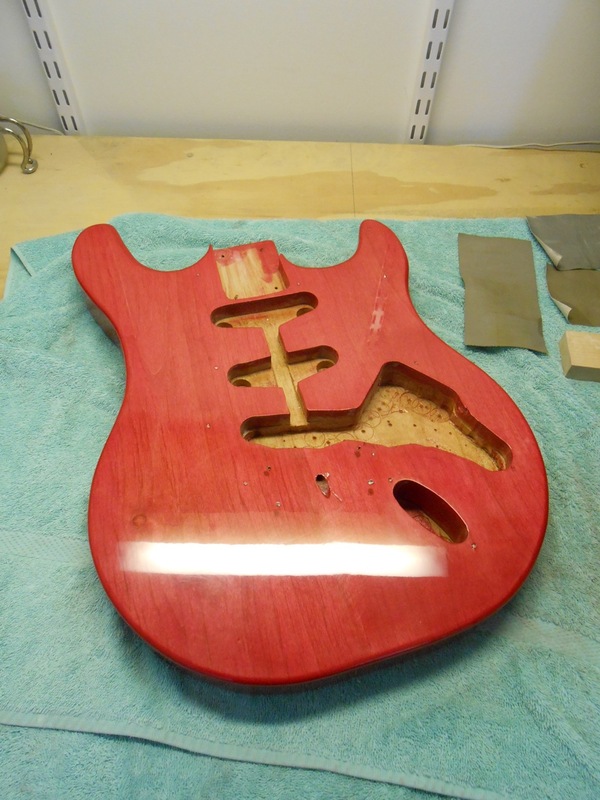 And because someone will ask (maybe) – wet sanded with P800, 1500, Micro-Mesh 6000, 8000, and 12000, then Meguiar’s Scratch-X. This took longer than I’d planned. Fit, carve, sand, repeat. Came out okay on this side. Not too bad here. 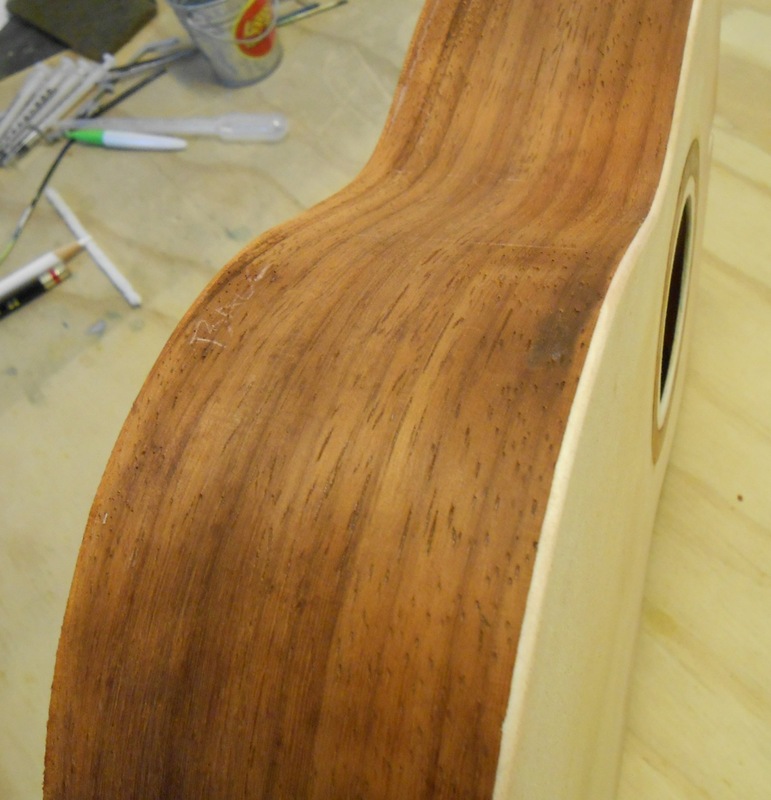 A bit more sanding needed. Two tenor necks. 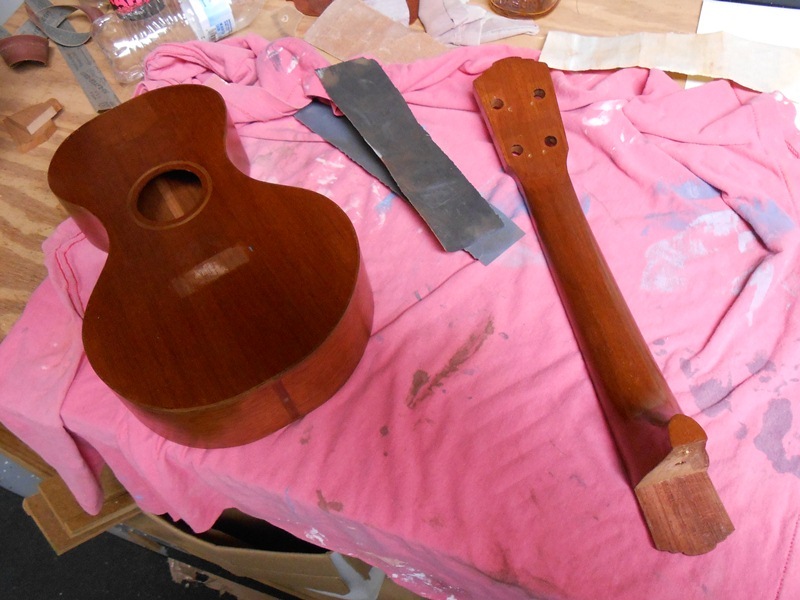 One is from an old instrument that is being reworked, the other is new. Both need more work, obviously. New neck, old neck, shy neck, bold neck. Wait, that doesn’t make sense. 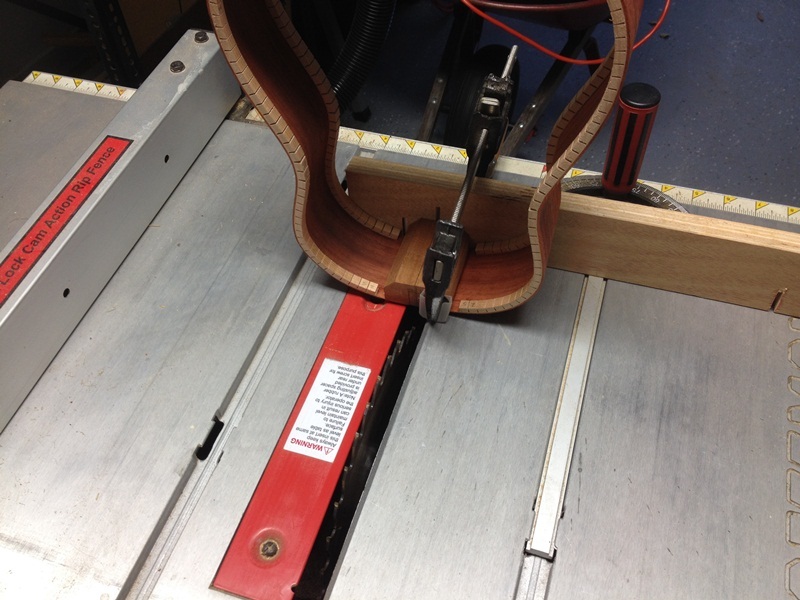 Cutting that tenon would have been a lot easier if I’d planned ahead and done it on the table saw before I glued the ears on the headstock. 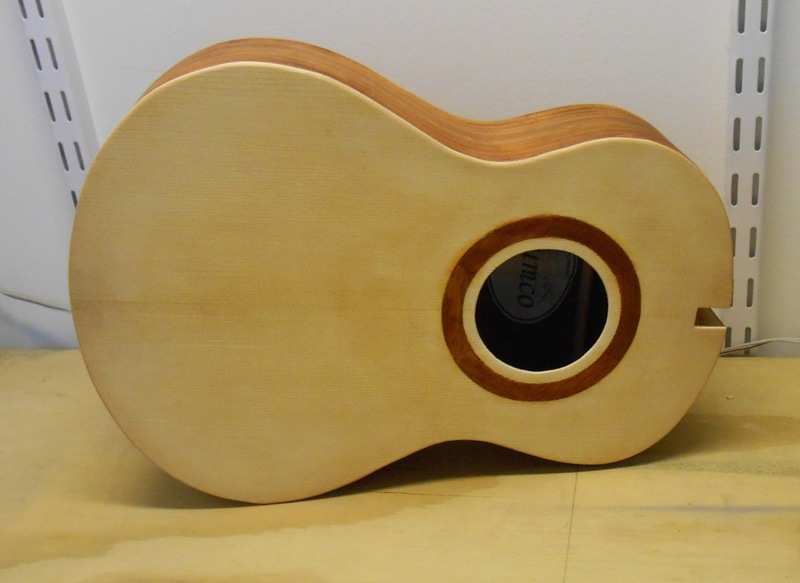 Either way I expect it would need fine-tuning with a chisel, so no real difference. 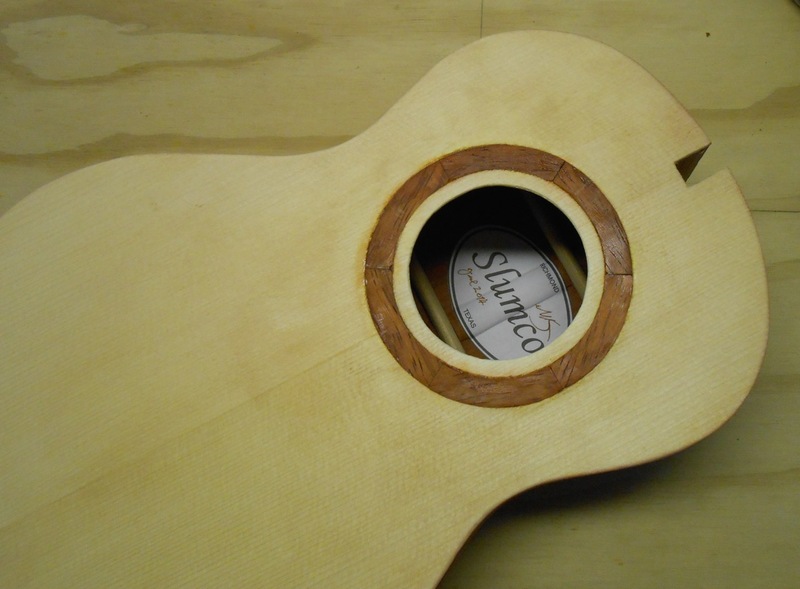 The old neck is getting about 1/8″ taken off for the entire length. It’s too heavy and feels like playing a baseball bat. 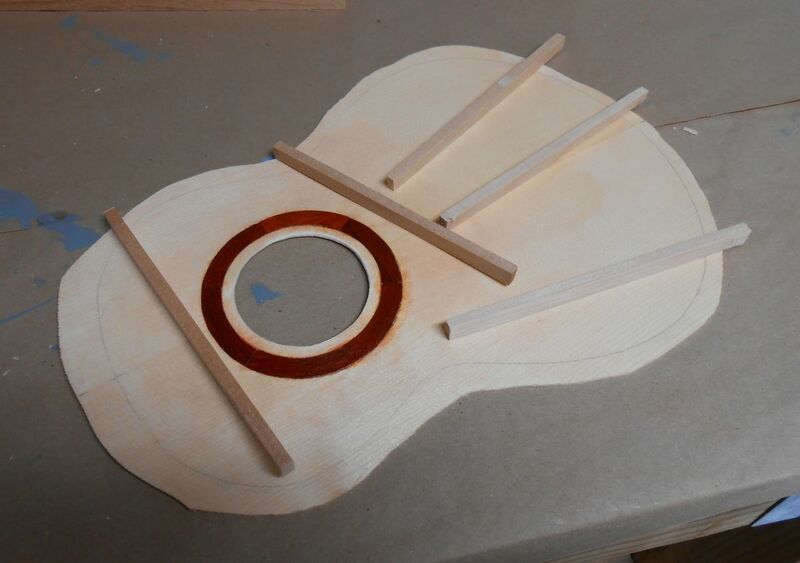 I’ve already planed the headstock down. Next week I’ll have something different and hopefully exciting (in a good way, not involving blood or paramedics.) If I get around to posting it. Well, this is a milestone. Made static compliance measurements of the top, stuck in a label, glued on the back, trimmed the overhangs, started sanding. Clickify to embiggenate. Pretty pleased with it so far; I won’t go into the known flaws at this time. Glued the top on and did the initial trimming of the overhang. 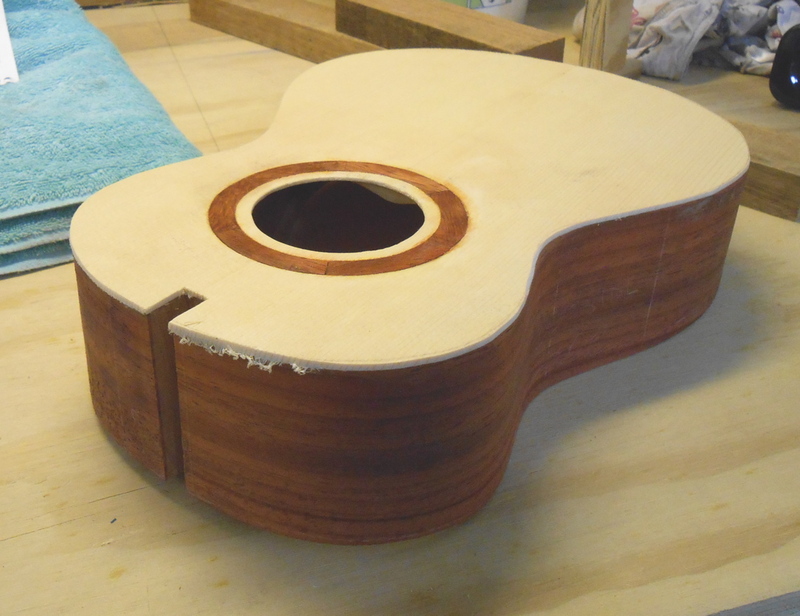 Apparently the top slid a little bit during the glue-up. No big impact to how it plays, but I’ll never be 100% happy with how it looks. 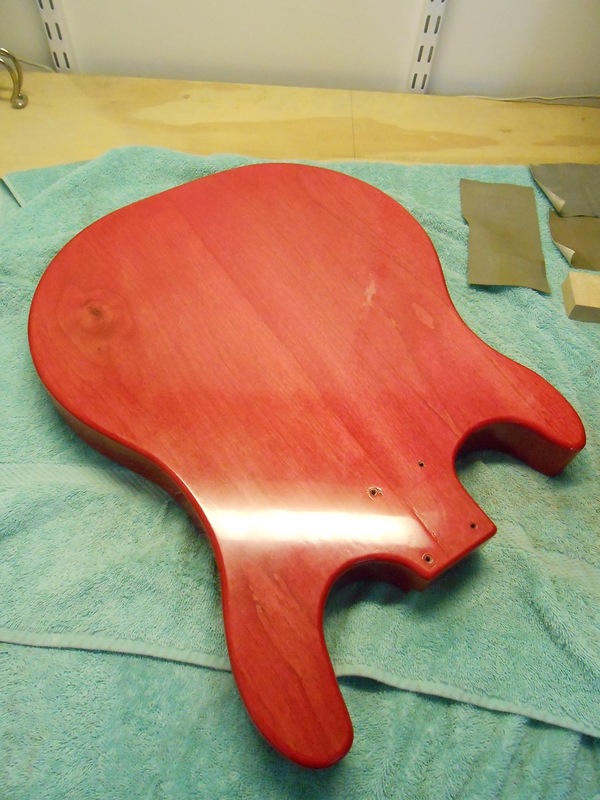 Pay no attention to the fuzzy bits of spruce; that’ll be sanded off. Here’s a shot of the insides. Braces are tucked under the lining. That didn’t turn out too bad. 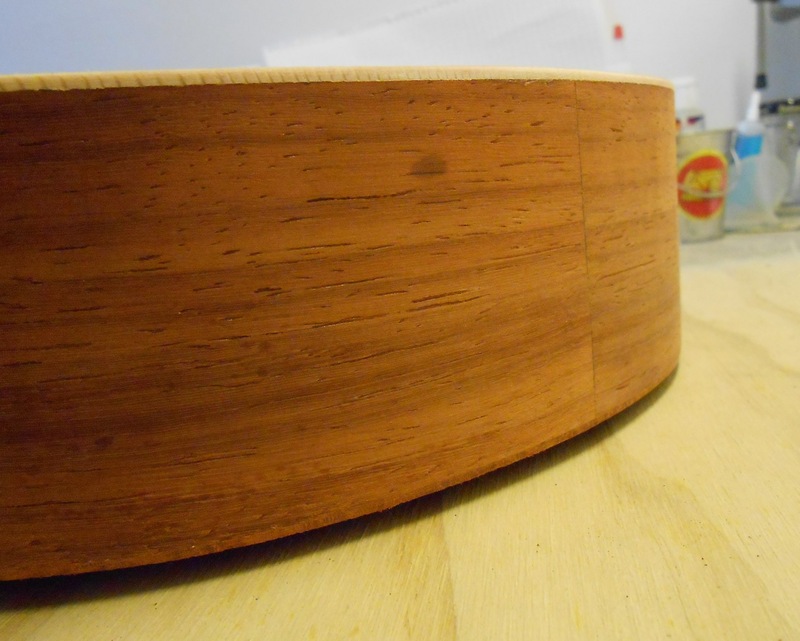 One side is straight from the table saw, the other is with a chisel. Could have done the whole thing with a chisel, really. 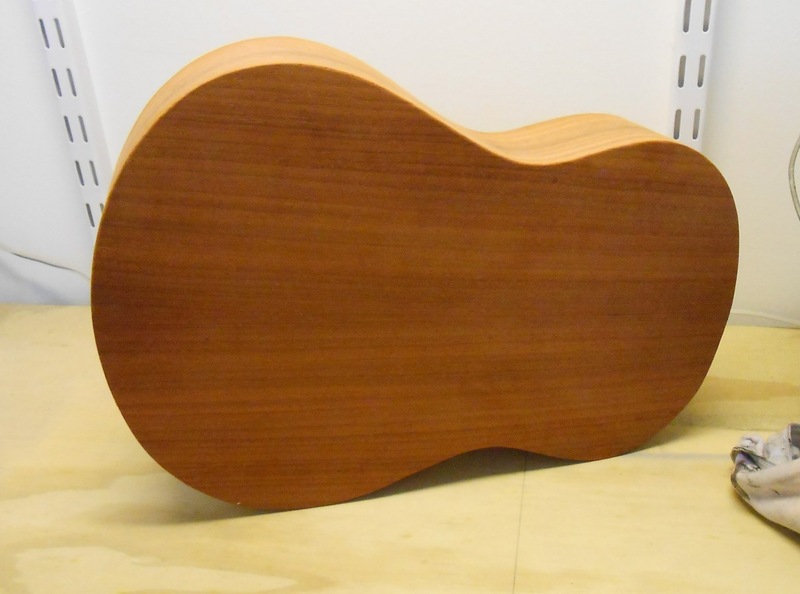 The neck block is mahogany and carves easily. 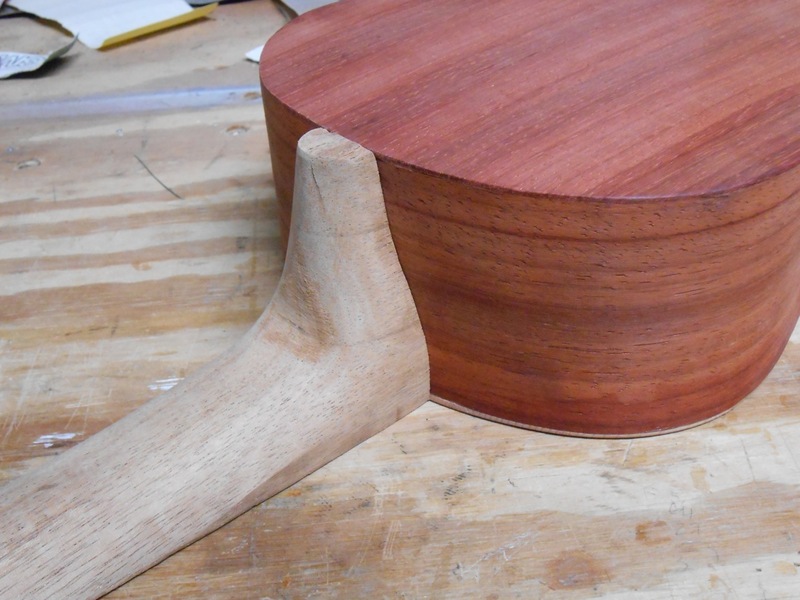 I decided not to go with a tapered dovetail because this should be strong enough to hold the neck on agains the tension of uke strings. Plus, it’s more work getting the dovetail to fit properly. 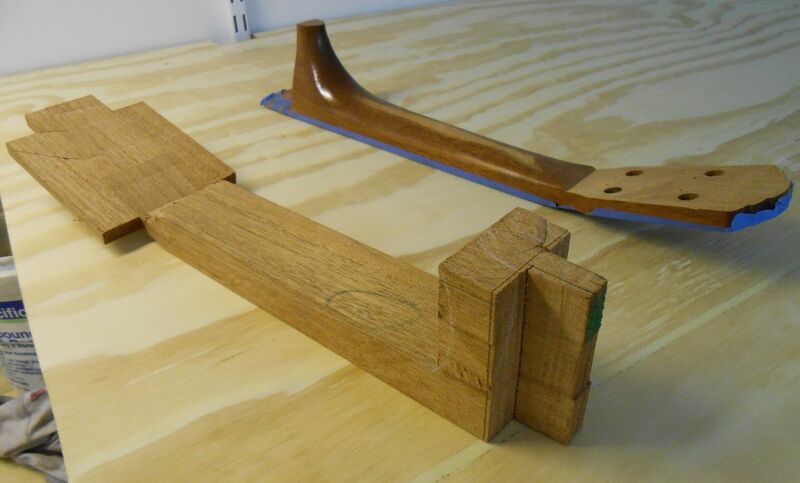 It would have been a lot easier to cut the mortise before I’d glued the headblock to the sides. It would have been square, too. Not the best way to do this. Came out reasonably well. I just need to do some cleanup with chisel and handsaw. 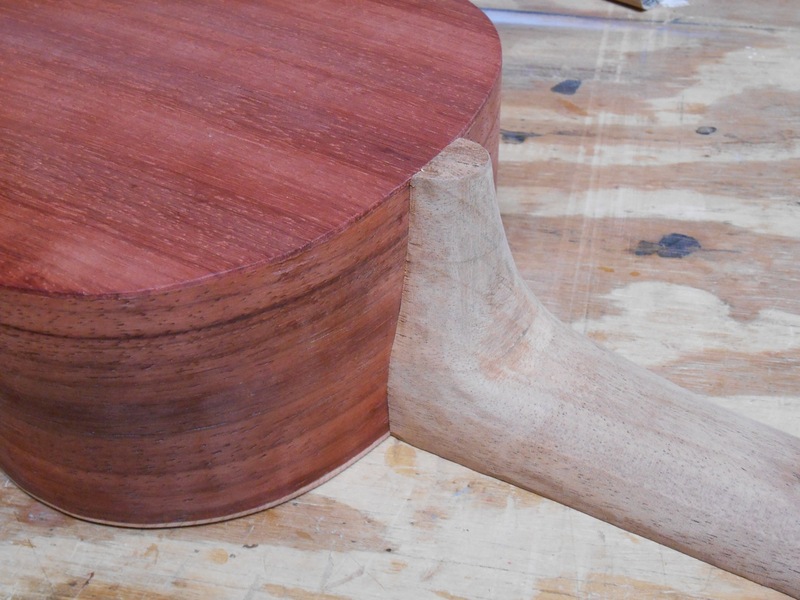 Neck tenon will be cut and adjusted to fit. Shims if needed. 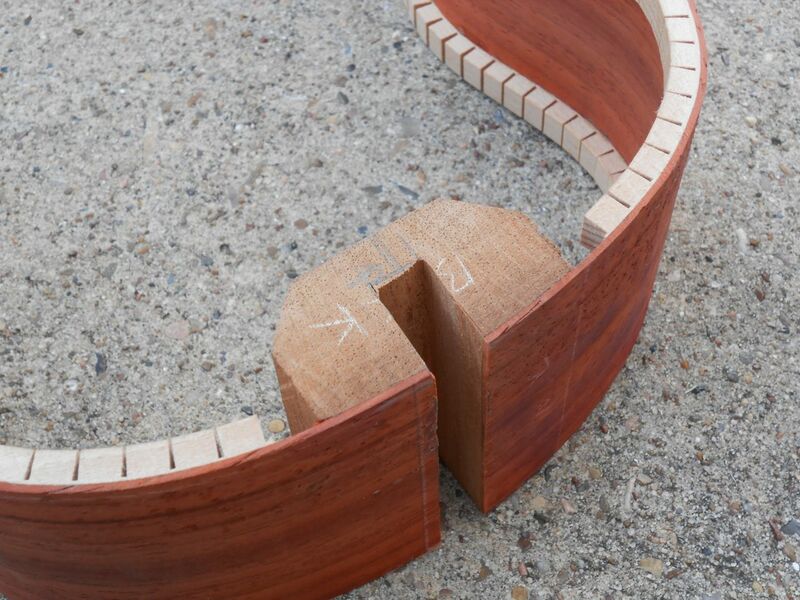 One of these day’s I’ll make a crosscut sled. 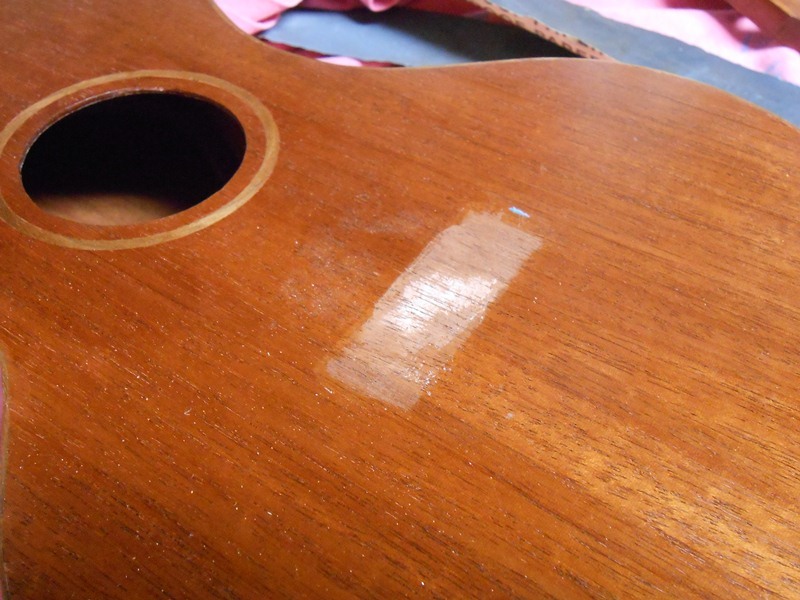 The bridge on my first uke finally popped off last week. It had been pulling away from the body at the back edge for quite a while, so I was expecting this. 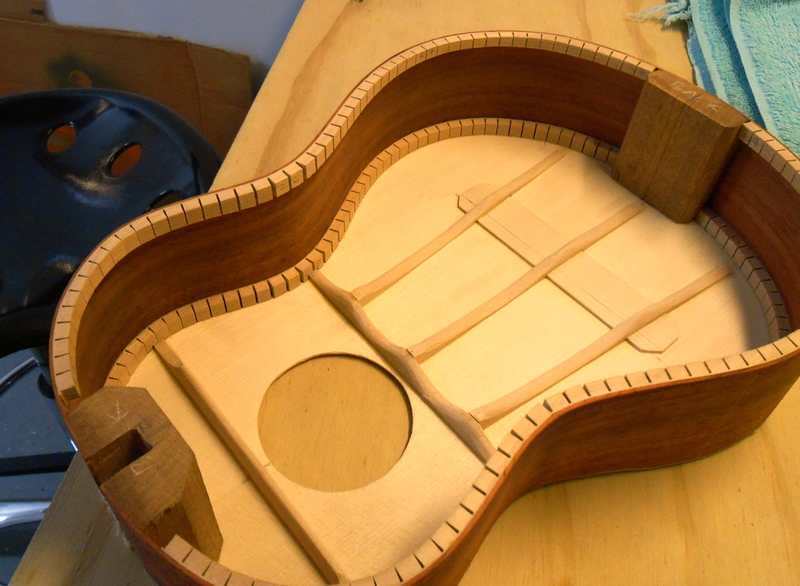 Decided it would be a good time to try carving the neck down a bit more, because it’s like trying to play a baseball bat. The fretboard is pretty decent. Above I’ve removed the bolt-on neck (hex wrench through the soundhole, not the easiest thing to do), the tuners, and the nut (which would be hidden in this shot anyway.) I thought about reworking the body, but at most I’ll do a better pore fill and maybe soften the corners a bit. Here’s a shot of where the bridge was. Not sure if I’ll make a new one or just reglue the old. 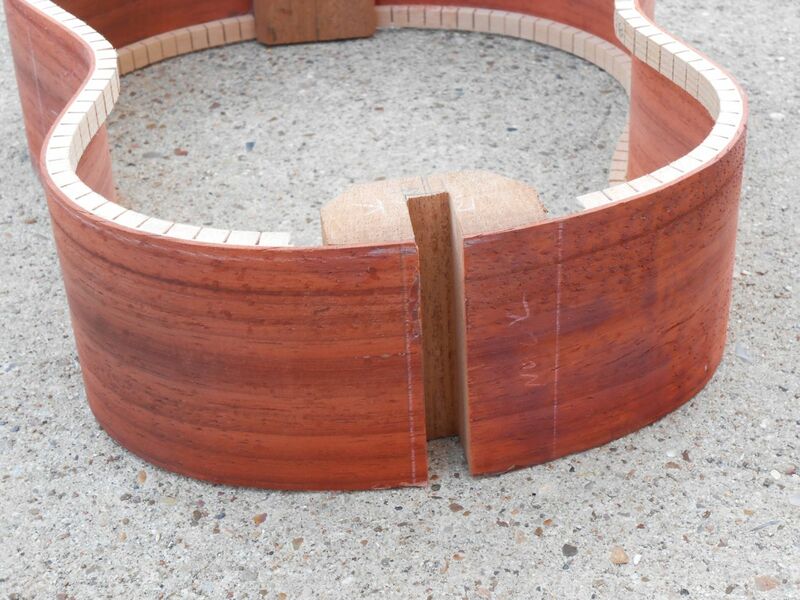 I don’ t think I have any bubinga scraps the right size. The bridge stayed in place for ten years, which is pretty good for a first attempt. This is looking okay. 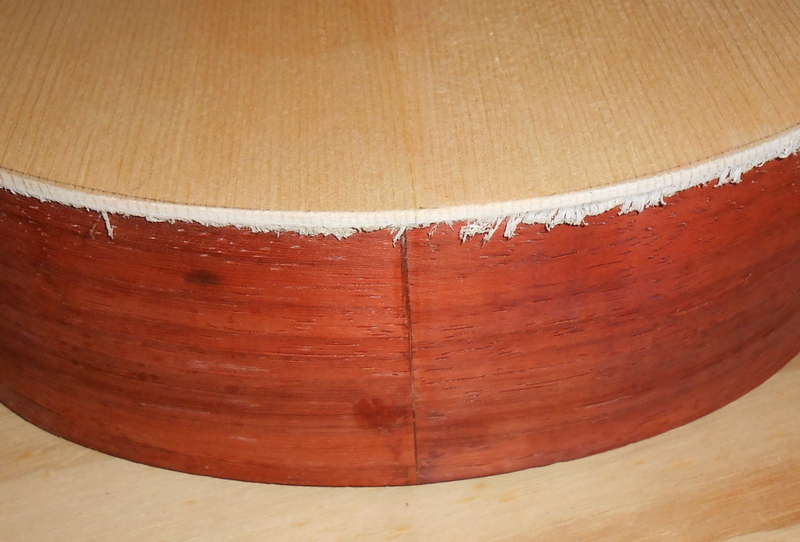 Engelmann spruce, with rosette of padauk. The braces are spruce also. 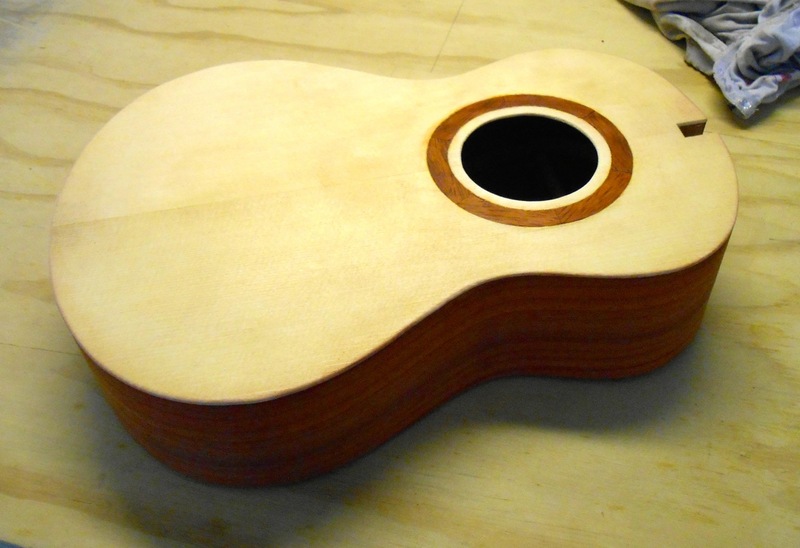 The discoloration around the rosette will even out in finishing.